If you are looking to develop a strong back and core then these 6 kettlebell row variations are for you. The kettlebell row is a fundamental exercise that uses the horizontal pulling movement. Below I have listed 6 kettlebell row variations for you to practice. Each rowing variation gets progressively more challenging so start at the top and work your way down. All of the following kettlebell rowing exercises will strengthen your: rhomboids, trapezius, biceps, grip, core muscles and posterior shoulder muscles. Technique is very important with all these exercises so watch the included kettlebell videos to help you get your technique right. Breathing throughout all these kettlebell exercises will be very similar, brace and hold your breath temporary as you row towards your body. If the kettlebell weight is not very challenging then you may be able to breathe in as you row up and out as you lower the kettlebell. 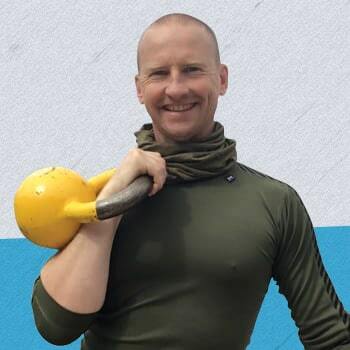 As your diaphragm is both used for breathing and stabilisation of the spine you will not be able to breathe through the hardest part of the exercise if the kettlebell is heavy. The kettlebell regular row is a fundamental exercise that will add muscle and strength to the back. Lean forwards about 45 degrees so the kettlebell hangs around shin height. Keep your weight back on your heels and bend your knees so you can sit back into the position. Your lower back position is important, it should be kept flat from shoulder to hips. Using one arm row the kettlebell up towards your hip as if being pulled by your elbow. Be sure not to pull from your upper back and neck, your shoulders should be pulled towards your hips. Pause for 2 seconds at the top of the exercise and squeeze your shoulder blades together then slowly lower the kettlebell back down. Don’t allow the kettlebell to pull your shoulder towards the floor and rotate your upper body, keep your shoulders square with each other. Practice: work up to 12 repetitions on each side. The kettlebell suitcase row has similar benefits to the regular row except the kettlebell is rowed to the side of the body. Start with the feet close together and place the non kettlebell hand across your belly. Again sit back on your heels and lean forwards keeping a nice flat back. Row the kettlebell up and towards the hip, pulling from the elbow and not the upper back. Pause at the top of the movement for 2 seconds before lowering the kettlebell slowly back down. The double kettlebell row will save you time by working both sides of the back at the same time. With the addition of an extra kettlebell the load through the hips, hamstrings, core and back muscles is much greater than the single kettlebell rowing variation. Please make sure you are comfortable with one kettlebell before attempting this double kettlebell rowing variation. Technique for this double kettlebell variation is the same as for the single kettlebell exercise. 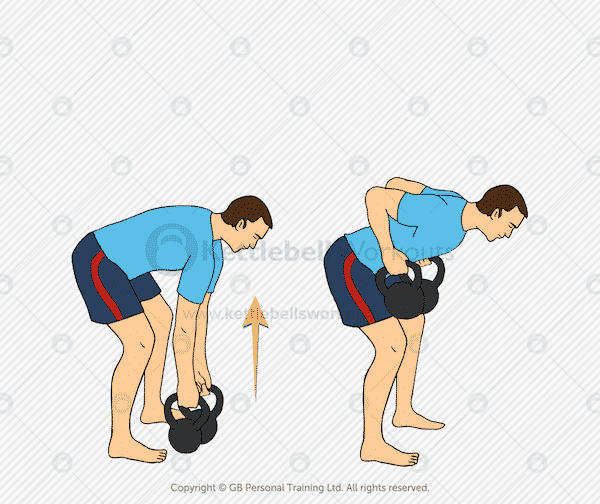 Symmetry throughout the exercise is important so make sure you pull and lower the kettlebells at the same time. 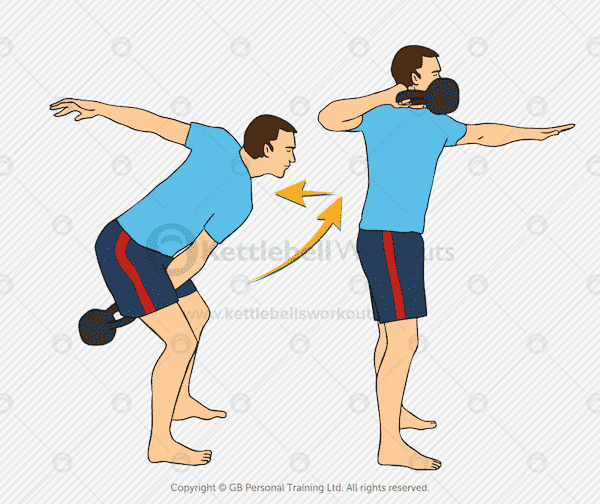 Practice: as the double kettlebell row is more of a strength based exercise repetitions can be reduced. Work up to 6 – 8 repetitions. The kettlebell plank row on a bench will activate more of the lower back and core muscles. Beginners should be comfortable holding the top of a push up position for at least 30 seconds before attempting this kettlebell row variation. The key to this rowing variation is holding your body in a straight line from heel to shoulders without letting your hips drop. With one hand on a bench or box brace your core and row the kettlebell back towards the hips. Again be sure to pull from the elbow and keep the shoulders away from the ears. You will feel a strong rotational pull through the core muscles during this exercise, your job is to resist this rotation and maintain good alignment. Practice: progress to 10 repetitions on each side. If your hips drop and you cannot maintain straight alignment then you must stop. The kettlebell renegade row takes the above row on a bench to the next level using two kettlebells. 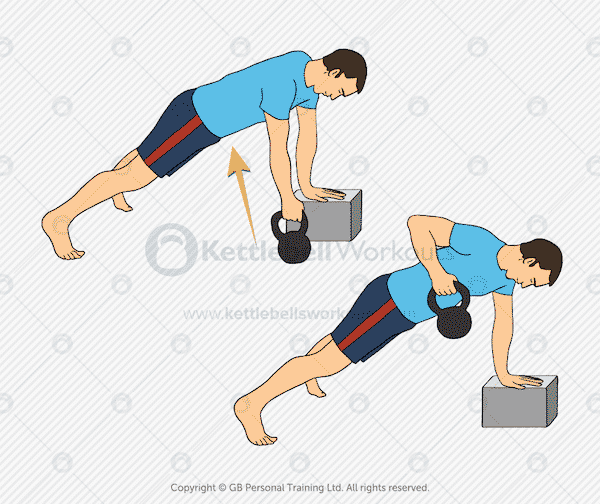 Those new to this exercise must feel comfortable holding their body in a plank position on top of two kettlebells. Care should be taken when on top of the kettlebells that they do not topple over sideways and trap your fingers. You can now row the kettlebells just as with the other kettlebell rowing variations. Take your time and work on good body alignment through this rowing exercise. Practice: progress to 8 reps on each side before practicing alternating sides for a total of 20 reps. 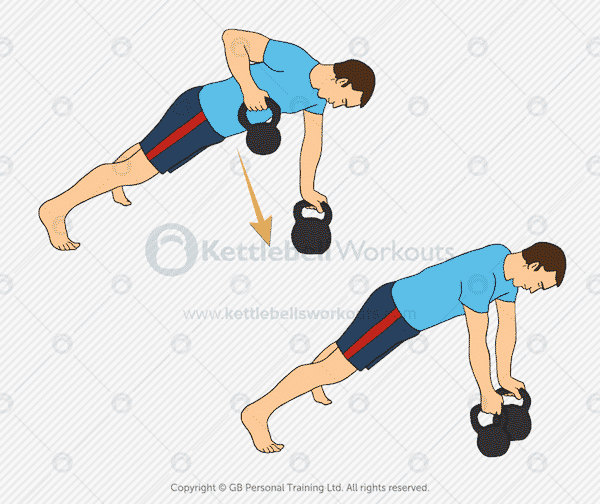 The kettlebell high pulls exercise is a dynamic standing kettlebell row variation. Unlike the other 5 rowing variations this kettlebell exercise will challenge your cardio, hips, hamstrings, buttocks and back muscles. Beginners should first master the kettlebell swing before moving onto this rowing variation. The kettlebell high pull exercise is rowed back at an almost horizontal position taking the load away from the neck and into the back. Keep your wrist tight at the top of the pulling movement and forearm inline with the kettlebell. Be careful when you first start to practice this exercise that the kettlebell doesn’t hit you in the face. Practice: 20 reps before changing sides is a good target. You can change sides just the same as with the alternating swing exercise. 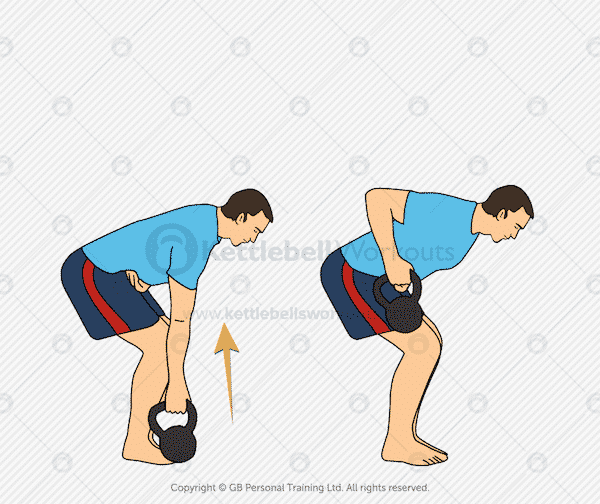 The kettlebell row is an important kettlebell exercise to develop the back and core muscles. Horizontal pulling exercises are important to balance out all the pushing movements often overused in workouts. Above I’ve listed 6 different rowing variations starting at the easiest and progressing to the most challenging. As with all kettlebell exercises start out with a light kettlebell and increase the weight when you get to grips with the movement. 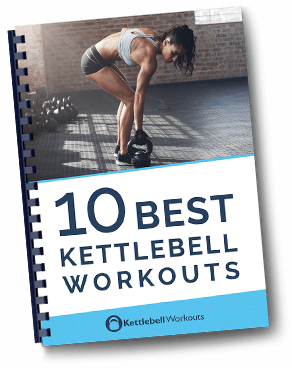 Have you tried any of these kettlebell row variations? Let me know below….